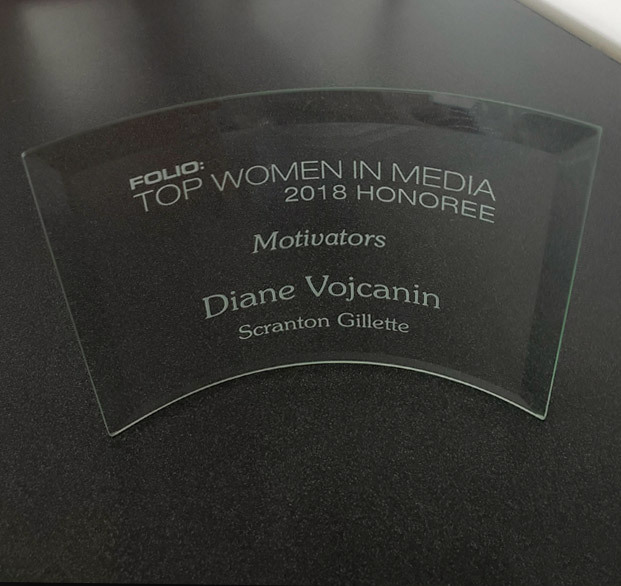 Scranton Gillette Communications' publications, print and digital, as well as its brands’ enewsletters, video series, podcasts, social media content and websites, have earned and continue to earn publishing industry recognition for editorial and design excellence. More than 100 awards over the history of the company have been earned by our excellent editorial team and content creators. The Jesse H. Neal Awards honor journalistic excellence in business media. 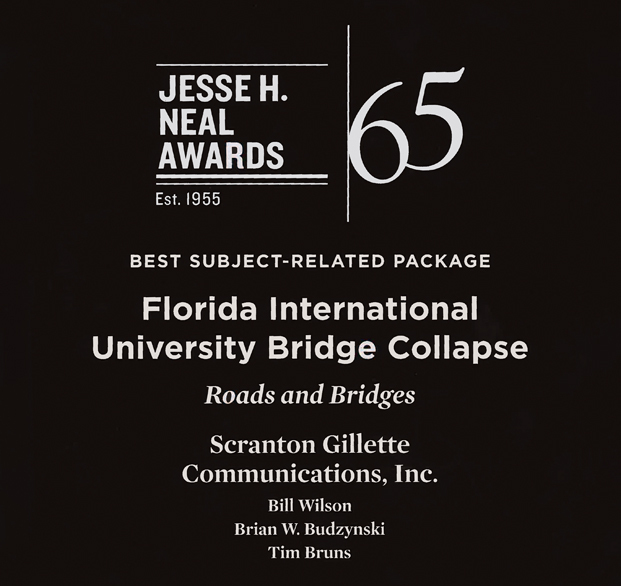 In 2019, Imaging Technology News won a Jesse H. Neal Award for Best Technical Content, and Roads & Bridges won in the category of Best Subject-Related Package. Recognized as the "Pulitzer Prize of business press," the Awards, presented by Connectiv, select winners for exhibiting journalistic enterprise, service to the industry and editorial craftsmanship. 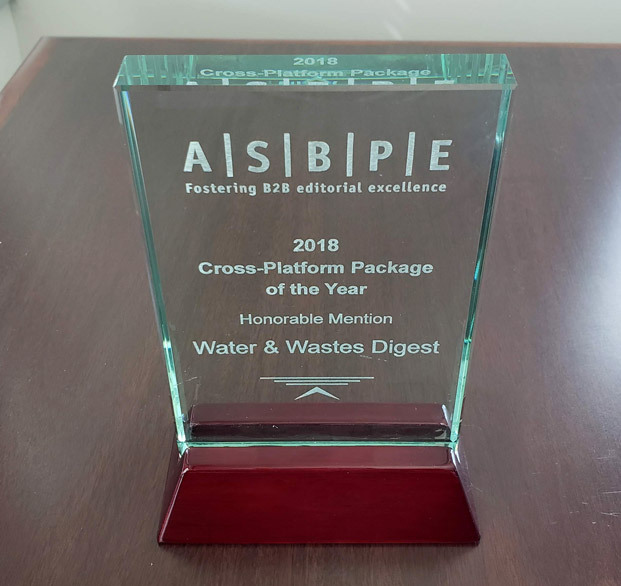 Two other Scranton Gillette Communications brands earned Finalist honors in 2019, including Diagnostic and Interventional Cardiology, and the Water Infrastructure Group (Water & Wastes Digest, Industrial Water & Wastes Digest, Water Quality Products, Storm Water Solutions). Most recently, the American Society of Business Press Editors’ Azbee Awards have selected multiple brands across a wide range of categories. In 2019, Azbee Finalist Honors have been presented to the editorial and design teams of the following Scranton Gillette Communications brands: Imaging Technology News; Diagnostic and Interventional Cardiology; Roads & Bridges; Water Quality Products; Water & Wastes Digest; Industrial Water & Wastes Digest (the Water Infrastructure Group). Finalists were recognized in the categories of Overall Excellence in the Cross-Platform Package of the Year, as well as with national and regional honors. The Jesse H. Neal Awards are the most prestigious editorial honors in the field of specialized journalism. They are widely considered the “Pulitzer Prize of the business press.” The Neal Awards were established in 1955 to recognize and reward editorial excellence in business media. Folio: Awards provide media executives the opportunity to showcase their best editorial content, designs, marketing initiatives, digital products, and people. ASBPE’s Azbee Awards of Excellence program is one of the most competitive for business-to-business and professionals publications. The awards recognize outstanding work by magazines, newsletters, and digital media.